This article is about the section of Interstate 95 in Rhode Island. For the entire route, see Interstate 95. "Route 84 (Rhode Island)" redirects here. For the once-planned interstate highway with the same route designation, see Interstate 84 (Pennsylvania–Massachusetts) § Rhode Island. The diagonal corridor of Route 3 was a well-traveled shortcut to the older U.S. Route 1 even before any part of Interstate 95 was built. In the 1930s, a further cutoff was built in southeastern Connecticut and southwestern Rhode Island, joining Old Mystic, Connecticut to Route 3 in Hopkinton, Rhode Island. The existing Route 84 in Connecticut was rerouted to use the new road (now Route 184), and the short piece in Rhode Island was also numbered Route 84. (This alignment had been the Hopkinton and Richmond Turnpike - better known as the New London Turnpike - but had fallen into disrepair.) The right of way of New London turnpike goes though the Big river management area (as a dirt road), crosses division road as a four-way intersection with the North side of the turnpike paved, has an interchange with Interstate 95 (exit 7), continues for 1.85 miles before connecting with Route 3 in West Warwick for a ¼ mile. New London Turnpike turns into New London Ave and continues straight for 2¼ miles before connecting with Providence street (RI-33). It follows Providence Street until it hits the Meshanticut Interchange. The first section of what is now I-95 was planned as an upgrade and relocation of Route 84 and Route 3 from the state line north of Westerly to existing Route 3 of Richmond. The short Route 84 was widened to a four-lane divided road with one intersection at Gray Lane. Instead of merging with Route 3, it was modified to continue northeast, passing under Route 3 with a folded diamond interchange (modern day exit 1). The rest of the new road was designated Route 3 once it was completed on December 12, 1955. It was not built to freeway standards, only having interchanges at Route 3 in Hopkinton and Route 138 in Richmond (a cloverleaf) (modern day exit 3), as well as a bridge over the Wood River and Mechanic Street. A section of freeway (known as the Kent County Freeway) opened in July 1958, running from Route 3 at Kitts Corner northeast across the Big River (modern day exit 6) and east across Route 3 to Route 2 on the West Warwick-Warwick line (modern day exit 8). Its west end was a simple intersection with old Route 3, in which only northbound traffic could continue on the old road — southbound traffic had to enter the new freeway east of the Big River. The only two interchanges were with Route 3 east of the Big River (a diamond interchange) and with Route 2 at its east end (a four-ramp interchange providing half the ramps of a cloverleaf). The Interstate 95 designation was approved on June 27, 1958. The section in southern Rhode Island was temporarily designated Route 95 until it could be upgraded to a freeway. This route ran from the Connecticut state line along what had been Route 84, continuing along the Relocated Route 3 to north of Richmond, along normal Route 3 to Kitts Corner, and along the new freeway east to Route 2. As much as possible, Route 3 was moved back to the old road; it only used the new freeway by necessity in the area near Kitts Corner and over the Big River. Connecticut also renumbered their section of Route 84 to Route 95 at that time. Interstate 95 in Connecticut was finished December 12, 1964 to the Rhode Island state line, where it connected to the older Route 95 divided highway. The old road from the border to Gray Lane was combined with the frontage road built when Route 84 was upgraded to form what is now known as Extension 184. The portion from the Connecticut state line to Route 3 north of Richmond was upgraded to a freeway with construction ending May 1968. To the north, that freeway was connected with the Kent County Freeway by a new section, opened November 22, 1969 as the last section of I-95 in Rhode Island. The connection to Route 3 at Kitts Corner was removed, and Route 3 was moved back to the old road over the Big River. Route 95 was renumbered Interstate 95, as the whole road was now a freeway. An interchange with the New London Turnpike was added to the Kent County Freeway by 1972. In 1983, a new interchange with Hopkins Hill Road opened. 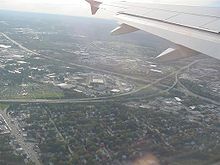 The construction of I-95 split the city of Providence in two, cutting off the city's western neighborhoods from downtown. Among the areas affected was Cathedral Square, which had been a bustling center of civic life before World War II. Interstate 95, constructed adjacent to Cathedral Square, changed the area's character forever. A 1972 redesign by I.M. Pei attempted to revitalize the Square but failed. The people of Pawtucket feared the construction of I-95 as early as 1949. Editions of the Pawtucket Times and The Providence Journal in 1949 recall how neighbors in the Woodlawn section of Pawtucket feared the construction of the highway. According to Rhode Island Department of Transportation blueprints, the highway was originally planned for the west side of Pawtucket, avoiding the Pawtucket River. The highway was originally designed to be constructed east of the New York–New Haven railroad tracks and create underpasses on Mineral Spring Avenue, Broad Street, and Dexter Street. The highway was meant to travel east of the Pawtucket–Central Falls train station and into South Attleboro, Massachusetts. The Pawtucket River Bridge is part of Interstate 95 and has been replaced. Exit numbers are sequential, but are to be replaced with mileage based numbers as per MUTCD 2009 standards by 2020. ^ a b c Google (February 5, 2016). "Interstate 95" (Map). Google Maps. Google. Retrieved February 5, 2016. ^ a b "kurumi: Connecticut Route 184". Retrieved 4 October 2014. ^ a b c "The Roads of Metro Boston - north–south Expressway". Retrieved 4 October 2014. ^ "kurumi: Connecticut Interstate 95". Retrieved 4 October 2014. ^ Kasakove, Sophie (7 September 2016). "In Downtown Providence, A Forgotten Piece Of Architectural History". Rhode Island Public Radio. Archived from the original on 12 October 2016. Retrieved 25 September 2017. ^ 2014 Interstate Strip Map (PDF) (Map). Rhode Island Department of Transportation. March 2014. Retrieved February 5, 2016. Wikimedia Commons has media related to Interstate 95 in Rhode Island. Wolke, Richard. "Building Route 95 – Part 1". Hopkinton Historical Association. Hopkinton Historical Association. Retrieved 25 September 2017. Prescott, Richard G. "Building Route 95 Part II". Hopkinton Historical Association. Hopkinton Historical Association. Retrieved 25 September 2017. This page was last edited on 7 April 2019, at 11:36 (UTC).